In the all-new Ghost Hunters International sneak peek, Joe and Scott investigate the kitchen of an old Villa when Scott exits frantically from the laundry room claiming he saw an apparition dressed in white. Joe rushes over to examine the room and communicates to rest of the team through radio about the incident and Barry advises them to continue to investigate. Tune in Wednesday, March 28th @ 9/8c on Syfy to see if they can catch anything on camera. Zak, Nick & Aaron return to Nevada City to investigate The National Hotel. While learning about the National Hotel, the guys hear that the town's underground tunnels and caves have a great deal of paranormal activity as well. These shafts are the final resting place for many Chinese workers, who died inside these caves during the times of the Gold Rush. Tune in Friday, March 30th to see what they find. George Brumder Sr. made his fortune publishing German language newspapers, reading material and sheet music. He decided to use some of his hard earned money to build a stately mansion in Milwaukee, Wisconsin for his eldest son in 1910. George Jr. and his wife Henrietta moved in and had eleven children. Only nine survived. George Sr. died in May of that same year. The Brumder family enjoyed living in this 8,000 sq ft mansion for ten years. When, Henrietta died in the early 1920s, the mansion was put on the market. It was sold to a man named Sam Pick, his brother Ed and their associates. Sam and Ed were affiliated with one of the Chicago gangster organizations supposedly Al Capone's. Their main objective for moving to Milwaukee was to establish a nightclub as a legal front for their illegal side businesses which included black market liquor, gambling and possibly prostitution. They decided to use the ballroom located in the basement for such endeavors. St. Patrick is the patron saint of Ireland and one of Christianity's most widely known figures. Despite his popularity, a lot of what is known about him is false thanks to hundreds of years of exaggerated storytelling, that includes the story about him banishing the snakes from Ireland. The story was actually a metaphor for the eradication of pagan ideology from Ireland and the triumph of Christianity. Near the end of the fourth century, St. Patrick was born in Britain to wealthy parents and is believed to have died on March 17, 460 A.D.
A fair share of haunted establishments have phantom inhabitants which could only be described as “friendly.” The Trocadero Pub in Birmingham, England is among them. Their most well known ghost is former landlord Henry Skinner. 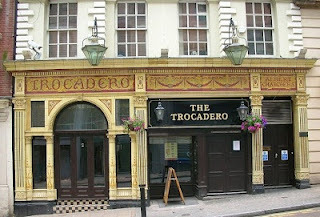 The Trocadero Pub began as the Fire Engine House for the Norwich Union Insurance Company (1846, Edge & Avery) in the 1800s. In 1883, it converted into a drinking house known as The Bodega. Henry Skinner served in the military before taking over the upscale wine bar. December 5, 1895 was the last day he stepped in to the building…alive. In Ghost Hunters International, the team travels to San Ignacio, Belize to help a man who is being tormented by spirits that haunt the Mayan Ruins of Cahal Pech. Catch the sneak peek clip as Susan takes part in a bloodletting ritual in order to contact Mayan spirits and tune in to the all-new episode next Wednesday, March 14 at 9pm ET. The season finale of Face Off premieres next week and the three remaining contestants are allowed to select three former contestants to join them in the final competition. Catch the all-new sneak peek and tune in as Rayce, Ian and RJ compete to be crowned the king of makeup magic! In Being Human, Sally lies, unable to wake from a dream and Josh and Aidan are found wondering where she might be. Apparently, Sally is actually dreaming about a life with the Reaper and might be locked inside forever. Tune in Monday to see if Sally will ever regain control and wake up from this dream. Mistaken identity seems to be a common problem among the paranormal along with inaccurate information. There is a local legend in Elizabethton, Tennessee which falls in to this category. It is said Grannie February haunts the Highland Cemetery. She is seen, sometimes on Halloween, wandering the grounds or heard rocking in her rocking chair. Problem is Grannie February a.k.a. Nannie February is not buried in the mausoleum containing the rocking chair. However, this is not a common case of wrong gravesite. Let’s start at the beginning. The Ghost Hunters International team investigates caves in Belize and a chateau in France during this next week’s episode. The team hears strange noises while searching for The Crystal Maiden in the caves while Susan claims that someone whispered in her hear at the French chateau. To find out if the spirits of the scorned women take revenge in Belize and who that strange voice came from, tune in on Wednesday at 9/8c! In next week’s Face Off, the contestants face a challenge that is prehistoric as they are challenged to mold and create a human-dinosaur hybrid. Sue struggles to make a skateboard for a prop while Rayce encounters a latex malfunction with his creation. Cleve Hall of Monster Man makes a special appearance as guest judge for the daunting double elimination that the contestants will face. Tune in on Wednesday at 10/9c to see what the contestants create with these tricky obstacles! After doing paranormal research and investigations for thirty years I have seen and experienced enough to write endless books about ghosts and the afterlife. However, there is another side of this research that never gets talked about. That is the long term effects that being touched by the energy of ghosts can cause. Sure we talk about what we experienced, if we caught any great evidence and the location itself but this one subject just never seems to come up in the conversation.